Scotty Parker returns after 8-week ride across the U.S. to secure safe water for others. Youngest known cross-country cyclist is an articulate, enthusiastic interviewee. 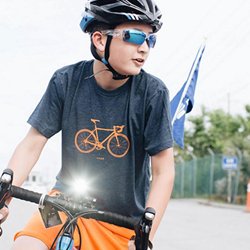 Scotty Parker successfully raised $590,000 for a non-profit battling the global water crisis by biking across the U.S.
Scotty Parker, a 13-year-old boy who biked across the U.S. to raise funds and awareness for safe drinking water, arrived home last week to a hero’s welcome. The driven teen successfully raised $590,000 for a non-profit battling the global water crisis - crushing his goal of $500,000. The money trickled in as the teenager and his riding crew logged 3,300 miles, encountering more than one hundred flat tires, lodging issues and plenty of generosity as they biked from Santa Monica, C.A. to Charleston, S.C. The funds directly benefit Water Mission, a nonprofit organization that provides safe drinking water for people who can’t access it due to disaster or lack of resources. At 7, Scotty learned that 1.8 billion people around the world do not have access to safe drinking water and are dying from water-borne diseases. He set out to make a difference: the money he raised will directly fund sustainable water systems to provide safe drinking water for 10,000 people. The Water Mission™ organization is a Christian engineering nonprofit that designs, builds, and implements safe water, sanitation, and hygiene (WASH) solutions for people in developing countries and disaster areas. Since 2001, Water Mission has used innovative technology and engineering expertise to serve more than 3.3 million people in 53 countries. Water Mission has over 300 staff members working around the world in permanent country programs located in Africa, Asia, North, South and Central America, and the Caribbean. Notably, Charity Navigator has awarded Water Mission its top four-star rating ten years in a row, a distinction shared by less than one percent of the charities rated by the organization. The organization’s international headquarters is located in North Charleston. To learn more, visit watermission.org.